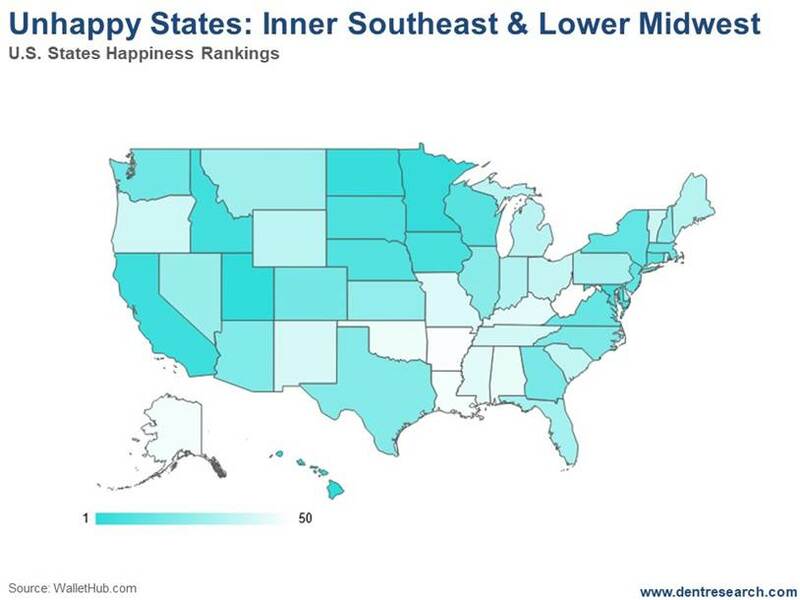 The unhappiest states mostly fall in the inland Southeast and lower Midwest. West Virginia is ranked as the least happy state in the nation. Note the whitish and very light blue shadings. So, what’s going on here and what economic significance does the data seem to carry? Well, two of the tangible common denominators from the individual categories are, not surprisingly, rising incomes and low crime/safety. The upper Midwest states have steadily growing shale jobs, which makes for a happier population. The Southeast and lower Midwest have been the hardest hit from our steady loss of manufacturing jobs. Who Are the Sad Sacks? Gupta noticed that the rising unhappiness is largely found in one particular sect of our economy: white, working-class males, especially between the ages of 45 and 54. They’re faring worse in a declining economy brought on by their own declining numbers. Immigration, automation, and foreign competition, especially in manufacturing jobs, has made their experiences so much worse. The U.S. has 5% of the world population and 80% of the opioid prescription abuse. Guess which generation dominates that epidemic! And guess where these people are concentrated: in the Southeast and Midwest… surprise, surprise. These are the voters who went overwhelmingly for Trump and helped elect him, against all expectations and odds. These are the voters who are the most anti-immigrant, anti-foreign workers, and anti-Muslim. All of this is to show you that my Geopolitical cycle has been dead on. Like I said earlier, this cycle turned negative around the time of 9/11, with radical Islamic terrorist attacks in the U.S. and Europe. But in recent years, 70% of such terrorist attacks have been from white supremacists. The devastating mass murder in New Zealand last Friday is just the latest example… and that’s in a country that’s peaceful and pro-immigration/diversity. New Zealand’s Prime Minister immediately declared that they would change their gun laws. (The U.S. has only succeeded in theorizing on such change, like a broken record, after each of our mass slayings.) That is a sign of progress and that this cycle is coming to an end soon, as originally forecast around 2020. But there is much more to come from this populist backlash against globalization. The simple truth is that it’s the global and domestic people that have fallen behind in the massive job and technological revolution of the past decades that are the most unhappy and fighting back. In Zero Hour, I warn of a broader political revolution on a 250-year and 84-year cycle that is just coming to a head and from which we’ll see more changes in the years ahead. The disenfranchised in the West have reacted against the radical Muslim and foreign worker threats. Now more of us are reacting against the white supremacists who are reacting with terror against that. Most of us are sick of both sides. My view has always been that we will have to realign our political structures around more common cultures within countries and within global regions. Countries like Iraq and Syria, with strong Sunni and Shia populations. just can’t get along. That’s increasingly true of the blue versus red states in this country and in the northern versus southern regions of Europe. Unhappy people cause political and social revolutions… it’s that simple. And there are plenty of them to be found around the world today. And my proven cycles saw it coming well ahead. P.S. Another way to stay ahead is by reading the 27 simple stock secrets that our Seven-Figure Trader says are worth $588,221. You’ll find the details here. Copyright © 2019 Harry Dent- All Rights Reserved Disclaimer: The above is a matter of opinion provided for general information purposes only and is not intended as investment advice. Information and analysis above are derived from sources and utilising methods believed to be reliable, but we cannot accept responsibility for any losses you may incur as a result of this analysis. Individuals should consult with their personal financial advisors.